Safeco Insurance is one of the insurance companies that we represent. Below is a great article about how having a trampoline might effect your Homeowners Insurance policy. Most home insurance carriers won’t allow for trampolines. The article below asks some common questions that people have about trampolines and the article does a good job to answer them. You know your kids would love a trampoline – they tell you so constantly – but something tells you that your homeowners insurance company may not. And, you could be right. More than 1 million people went to the emergency room (ER) due to trampoline-related injuries between 2002 and 2011, according to the Journal of Pediatric Orthopedics. The total cost of the injuries alone? More than $1 billion. The figures can make an insurance company wary. It’s not to say it’s impossible to get insurance coverage when you own a trampoline. It’s just that you should know what you’re getting into first before you even get one. Let’s take a closer look at some of the common questions regarding home insurance and trampolines to help you get started. Is it true some insurance companies won’t cover my home if I own a trampoline? Typically, when you purchase a home insurance policy, you are not only buying coverage for your house and personal property, but also liability coverage. Liability coverage may pay for things like the medical bills or pain and suffering of someone who was hurt on your property, especially if the injury occurred due to some negligence on your part. This may happen if someone trips on a sidewalk you neglected to maintain, gets bit by your dog or, yes, falls off your trampoline.Some insurers, but not all, simply consider trampolines too costly to insure due to the liability risks. Others make coverage readily available, though they may require safety equipment, such as a safety net and pads, as a stipulation of coverage. Can I pay extra to cover my trampoline if my policy doesn’t already cover it? Most likely not. Insurers either allow or don’t allow trampolines. Paying extra to cover your trampoline under your homeowners policy likely is not an option if your carrier has a no-trampoline stance. I’m certain my friends and family would never sue me, so it’s safe to get a trampoline – insurance or no insurance – right? If you do not think your friends or family would sue you should an injury occur, think again. If someone needs surgery or is out of work or school, they will most likely look for compensation. Even if they do not want to sue you, one of the first questions asked during an ER visit nowadays is oftentimes, “Were you injured at work, in a car or at someone’s home?” This allows health insurance companies to seek reimbursement for the cost of medical care from other types of insurers, such as a home insurance carrier. 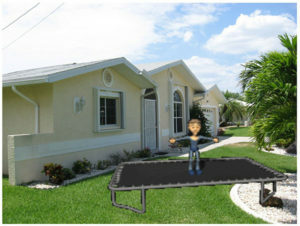 If I rent my home, can I get insurance coverage for a trampoline? If you’re a renter, you should get renters insurance, which is subject to the same guidelines as a homeowners policy. If an insurance carrier allows trampolines for homeowners, it will likely do the same for renters. Or, vice versa if it bans trampolines. As a landlord, should I allow my tenants to get a trampoline? Most likely not. If someone is injured on a tenant’s trampoline and sues, you will also most likely be named in the lawsuit, given that you own the property. If your tenant does not have any insurance, you may be the only one named. In either case, if your landlord insurance policy allows trampolines, you may have some liability coverage for the lawsuit, according to your policy. If it does not offer coverage for trampolines, you will be responsible for the costs on your own. If I have a trampoline, should I consider an umbrella policy? If you have a home insurance company that allows trampolines, you should absolutely consider purchasing an umbrella policy through the same carrier. Umbrella insurance provides extra liability protection on top of what your personal auto insurance or home insurance provides. Given that owning a trampoline could increase your risk of getting sued, you could very well appreciate the additional layer of financial protection that an umbrella policy delivers. Do I really have to tell my insurance agent about my trampoline? Without a doubt. It’s better to know up front whether or not your carrier will cover trampoline-related incidents. Plus, there’s this: Misrepresenting your property to an insurance carrier is grounds for claim denial and policy cancellation in some states. Telling your insurer you don’t have a trampoline when you actually do is misrepresenting your property. If you just can’t resist your children’s plea for a trampoline, I highly recommend you check in with your independent insurance agent first. Independent agents represent many insurance companies, not just one, so they have an understanding of which carriers will or will not cover a trampoline. It sure beats researching all the different carriers yourself, and it definitely beats any unpleasant insurance surprises that might spring up from owning a trampoline. Safeco Article about homeowners insurance and if they will cover trampolines, and specifically the liability. Halbrehder Family Agency is a Safeco Agency.